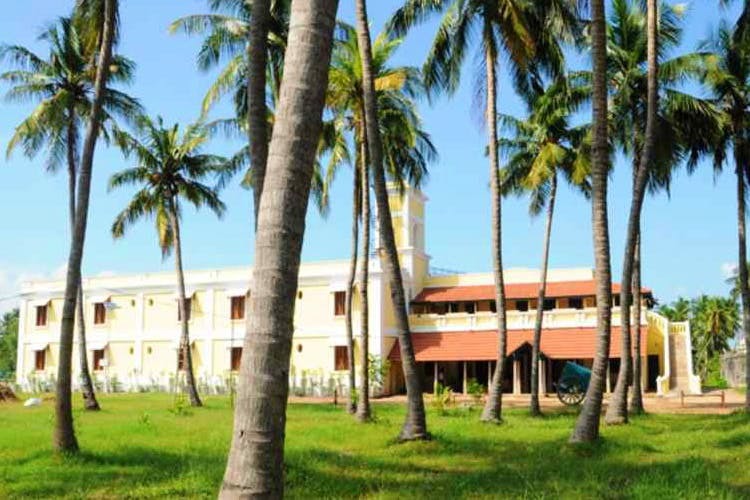 Lakshmi Vilas, heritage bungalow converted into a hotel in Chidambaram, is a great way to experience rural Tamil Nadu while also having a relaxing holiday. What was once a wealthy landlord’s home, Lakshmi Vilas has been converted into a heritage hotel for guests like you and me to stay at. The approximately five-hour journey south from Chennai is easy and relaxing provided you leave Chennai during non-traffic hours. The property was built in the 1850s and the Chola style architecture it follows is emblematic of rural houses at the time. The stone pillars and ornate wooden doors really make it feel like you’re in a museum. Though don’t worry you won’t be choking on any dust bunnies, as the hotel has solid maintenance and service. There are 14 rooms, each suitable for two people (or three, with an extra bed), and equipped with just the basic amenities (AC, TV, geyser, drinking water, etc). The rooms while not flush with luxuries are just the right kind of place to come and crash at after a day of exploring. There’s a restaurant too, called the Kamalambiga Heritage Restaurant that focuses on regional South Indian preparations (think appams and kuzhipaniyarams), where you’ll be able to eat your complimentary breakfasts. Outside the main hotel area, you’re surrounded by four and a half acres of coconut trees, mango trees and other flora. Birdwatchers don’t forget to bring your cameras and binoculars as there’s plenty of birds and other wildlife to spot. The hotel is a popular destination for most thanks to its proximity to neighbouring sights and attractions. The nearby Veeranam Lake supplies water to Chennai periodically and is huge! The Kaaval Deivam temple and the Vanamegannathar temple are both longstanding tourist hotspots that are less than five kilometers away. On the way to the temples is a potter’s street where you can how local make potters their wares and even buy yourself some! Just past the five km radius is plenty of Chola styled temples and heritage sites that are great for a day’s drive. If you’re looking for guided activities, the hotel staff will be happy to help you with organising picnics and so on, so do check with them. Prices for rooms start at roughly INR 4,000 per night (at the time of this publication). All in all, if you want a chance to explore our countryside and do so in relative comfort, then you’ll enjoy this the Lakshmi Vilas Heritage Hotel.